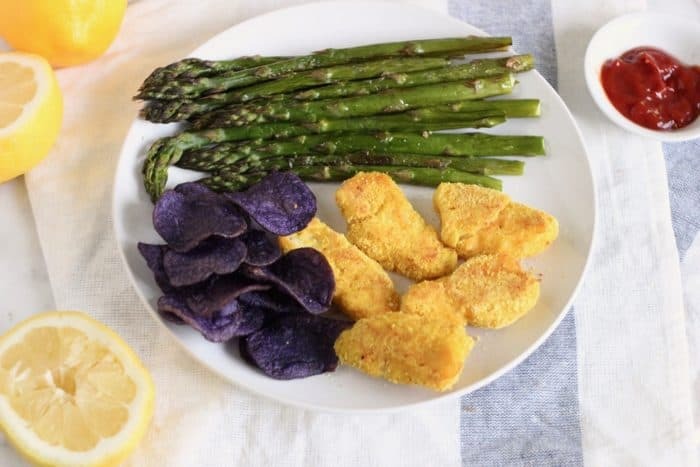 These updated baked gluten free Fish Sticks are served with a side of roasted asparagus for an easy meal baked all together on one baking sheet. Breaded in almond flour, these slightly nutty fish sticks will change you into a fish stick fan. Remember in the school cafeteria when they served fish sticks and people were either “yay fish sticks! !” or “hard pass… there’s no way I’m eating fish sticks!”? I was in the second group of fish stick haters. Fish sticks often get a bad name, and I feel like it’s because fish sticks are usually made with questionable fish (was it even really fish?!). 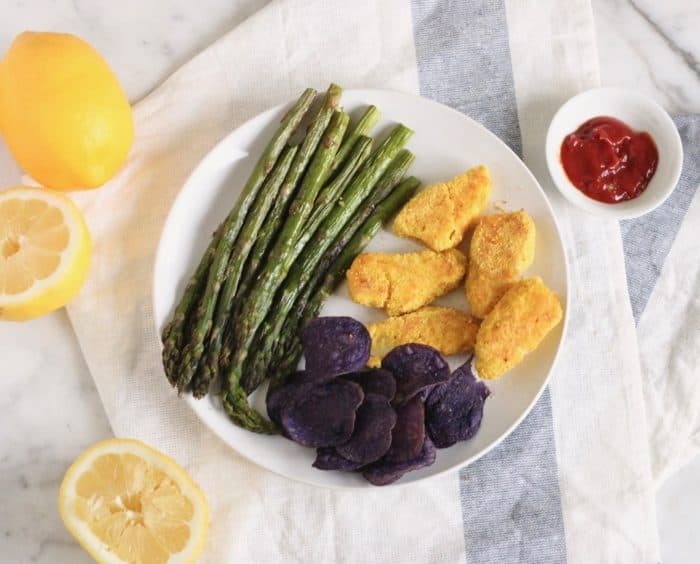 However, these are not your average, store-bought fish sticks! These fish sticks are made with cod and have an almond flour coating, so they have a deliciously subtle nutty taste. The spices give them color and flavor without overpowering the fish. The mild cod makes these fish sticks a great way to increase the amount of seafood in whoever you are serving eats. Seafood is high in vitamins, minerals, and protein. Cod is very high in selenium which helps boost immune system and fight inflammation. 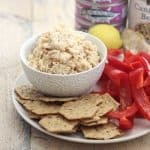 It’s also a good source of choline that aids in energy metabolism as well as helping your memory, Vitamin B12 which is linked to more energy, stress regulation, and prevention of anemia, and omega-3s which are both beneficial for your heart, brain, and skin. Start by cutting the fish into sticks, and pat them dry. Then add the cornstarch to a plate; whisk an egg and water together in a bowl, and add the almond flour + spices to another plate. Set up your work space so you have the cornstarch then the egg then the almond flour then your baking sheet. Using one hand, dip the fish in the cornstarch and shake off excess. Coat fish in egg and shake off excess. Transfer to almond flour. 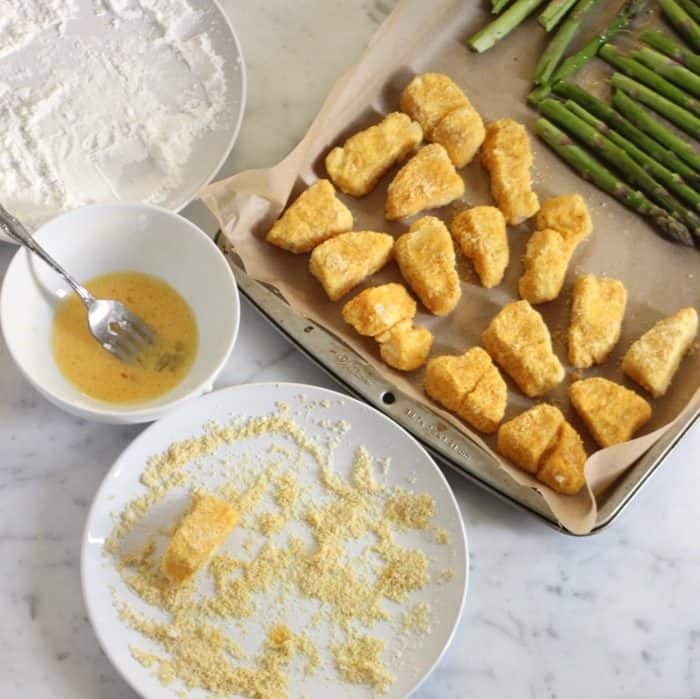 Using the other hand, roll the fish stick in the almond flour and transfer to one half of the baking sheet. Repeat with all the fish. Then get the asparagus ready by snapping off the ends and tossing with oil, salt, and pepper on the baking sheet. Bake and you’re ready to serve! You want a firm white fish for fish sticks. This is not the time to use a stronger fish like salmon. The best fish to use is one that is mild, white, flaky and firm — something like cod, haddock, pollock, and halibut. 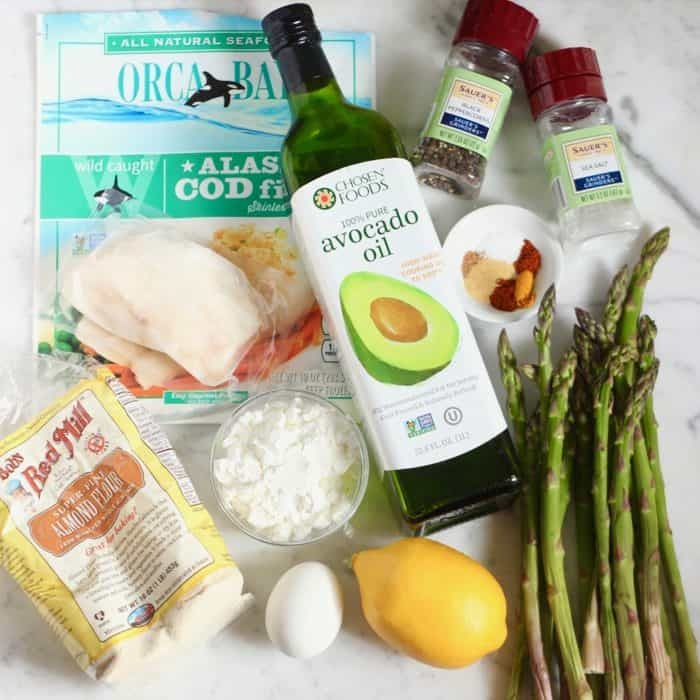 I used Alaska wild cod in this recipe, and I thought it was perfect. When buying cod, look for Pacific cod if possible. I like to get the Alaska wild cod, but if you cannot find cod from Alaska (or any type of Pacific cod), you can buy the Atlantic farmed cod. 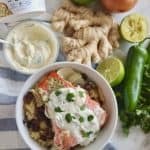 [Note: these recommendations are from Seafood Watch which is what I use to make sure I am consuming the best fish possible for my body and the oceans]. Thicker fish fillets are best, so you don’t have thin, overcooked fish sticks. Meaning that tilapia probably isn’t your best bet for a good fish stick. I like to buy frozen because it’s always in season, and you don’t have to cook the fish immediately. However, if you are buying fresh fish, be sure to make sure it doesn’t smell fishy. It should smell like the ocean (salty) but not fishy. And if you buy it fresh, keep it on ice in the fridge and use within a day or two but no more. 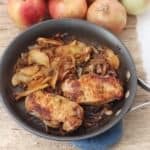 These are great to make ahead of time. 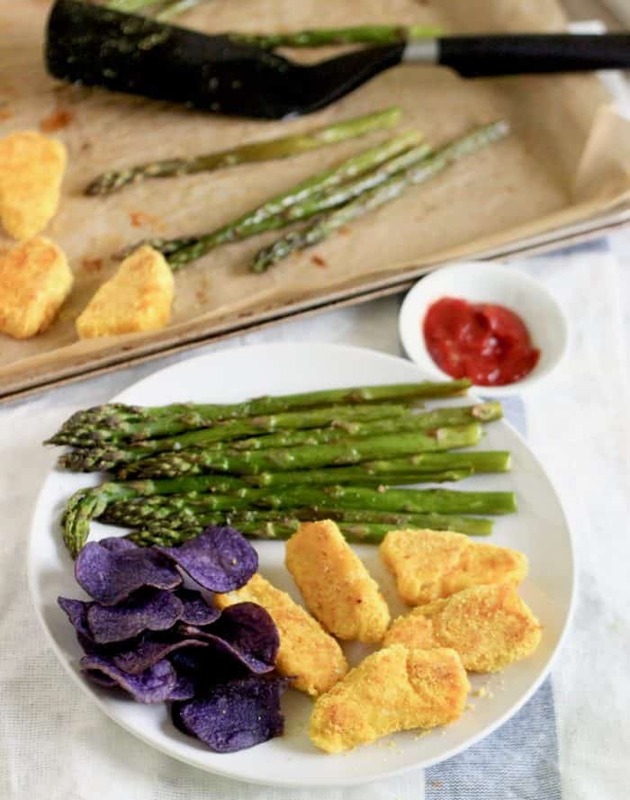 You can refrigerate the breaded fish sticks for up to two days or freeze them for up to 2 months. You can even bake straight from the freezer; just add a few extra minutes to your cooking time. If you have already cooked (then frozen) the fish sticks, bake for only enough time for them to warm through which is about 10-12 minutes. However, I recommend freezing them before baking to prevent overcooking the fish sticks. While I used cod to test the recipe, any firm white fish will work. 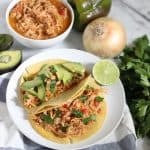 See above for more info on choosing the best fish for this recipe. All purpose flour will work in place of the cornstarch; use gluten free if needed. A substitute for almond flour would be bread crumbs; use gluten free bread crumbs if needed. Another alternative for the coating would be to use equal parts cornmeal and flour. If you are not a fan of asparagus, feel free to use any vegetable that roasts in about 15-20 minutes; softer vegetables, cut into small pieces, will work best — zucchini and eggplant are both great choices. 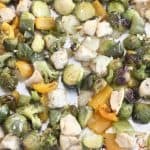 You can also use a vegetable that requires more time in the oven; just start cooking the vegetables before you add the fish sticks to the baking dish. For example, if you are roasting bell peppers which take around 35 minutes to roast, start cooking them in the oven 15 minutes before you add the fish sticks. Make sure not to use mushrooms or tomatoes as they will release their juices while cooking and could potentially cause soggy fish sticks. You could use another baking sheet to roast these if desired. The great thing about this recipe is that your protein and vegetable are all baked on one baking sheet. I like to serve mine with potato chips, but you could also serve with baked or roasted potatoes. Cube 1 pound potatoes (any kind) and toss together with a tablespoon of oil on a baking sheet. 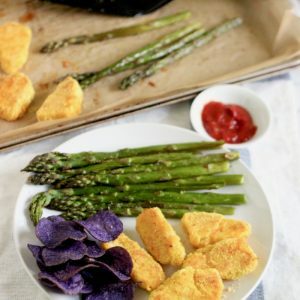 Bake in the 400*F preheated oven for 25 minutes, stir, then place the baking sheet with the fish stick and asparagus on another rack in the oven and bake for 18-20 minutes until done. Everything should be ready at the same time. 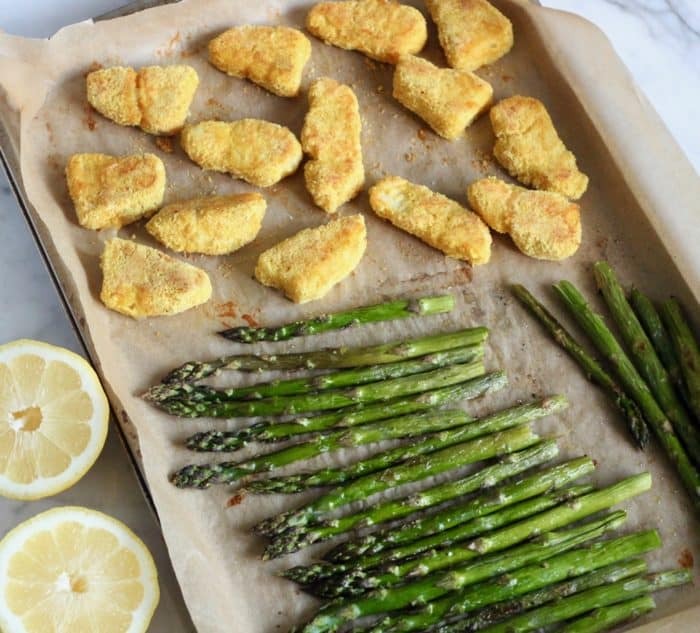 You’ll love these fish sticks especially since everything is baked on one baking sheet. 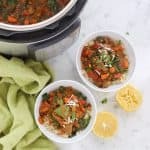 Great for a weeknight meal or for meal prepping to always have a nourishing protein at the ready. They’ll forever change your opinion of fish sticks into a positive one! Preheat the oven to 400*F. Line a baking sheet (or two if needed) with parchment paper or foil. Set aside. Slice the fish into about 1/2 inch thick pieces to make sticks. Pat dry, and set aside. Whisk together egg and water in a bowl, and set aside. Add the cornstarch to another plate, and set aside. On a small plate, stir together the almond flour, paprika, garlic powder, salt, turmeric, cayenne pepper, and nutmeg. Make an assembly line with the fish, then cornstarch, then egg, then seasoned almond flour, and finishing with the baking sheet. One piece of fish at a time, dip in cornstarch, coat completely, and shake off excess. Add to egg and coat completely. Shake off excess. 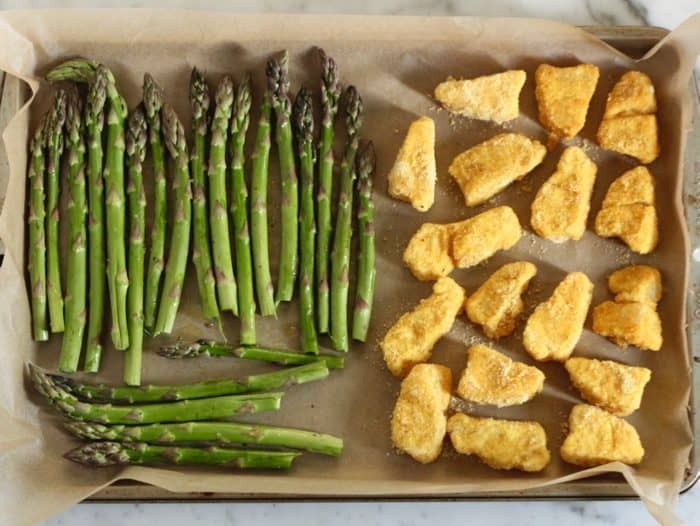 Then roll in seasoned almond flour, and transfer to the prepared baking sheet (keep the fish sticks on one half of the baking sheet to make room for asparagus). Repeat with all fish. Snap the ends of the asparagus, and place on the other half of the baking sheet. Top with oil, salt, and pepper; stir together to coat all the asparagus. Transfer to the oven, and bake for 10 minutes. Stir the asparagus and flip the fish sticks. Bake another 6-10 minutes until done. Sprinkle the lemon juice over the asparagus. Enjoy! *This recipe can easily be halved. But you can also freeze breaded fish stick for later. See post for more details. *Use another vegetable if asparagus are not in season. See post for more details. I have never had fish sticks before, but I’m gonna have to try these! They look delicious! Determined to make these for Lent this year! yum, love almond flour in breadings!! Need to try these for the kiddo, I bet she’d eat ’em up!